There are some common problems associated with in-ground pools, and they’re generally connected. One issue, such as settlement or shifting of the pool shell, will lead to a leak. From there, water causes additional movement that causes a never-ending chain reaction. The guiding philosophy of Rhino-Roc construction is to prevent the root causes of these problems before they occur. The area where a pool shell and patio join is a potential weak spot in any pool. The Rhino-Rod, a 12-inch composite rod, effectively fuses the fiberglass pool shell and patio together and prevents shifting of any kind. Installed into the top of the shell and encased in the concrete bond beam around the pool, the Rhino-Rod solves one of the major structural issues with in-ground pools. Movement can also cause leaks in pool plumbing systems. 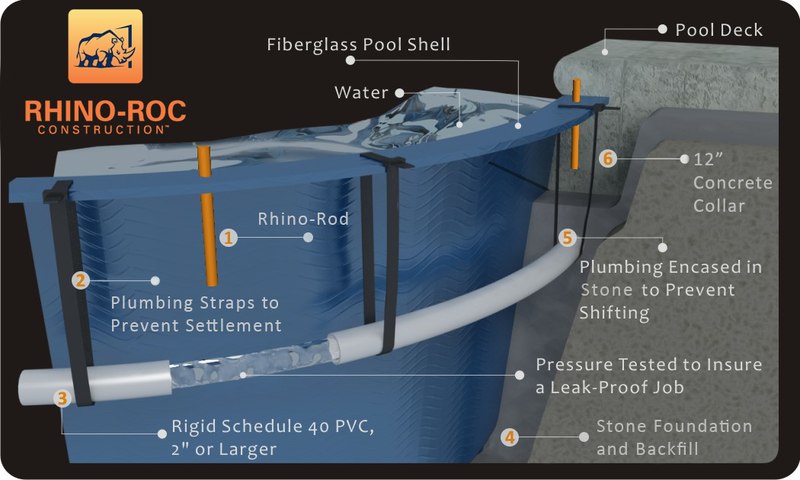 Shifting pipes can set off chain reactions that cause all kinds of damage, but Rhino-Roc construction features secure straps that fasten pipes to the pool shell. There’s no stress placed on the plumbing system, or in the minds of pool owners. Rhino-Roc construction uses hard plumbing pipe rather than flexible pipe. Although it requires more effort to install, hard pipe is the best long-term option because flexible pipe isn’t rated for underground use. Backfill is the material placed under the pool and around the shell after it’s set into the ground. It’s essential to use the right material for this purpose, and Rhino-Roc prefers clean, crushed stone for the job. Sand is adequate in certain places with pure, sandy soil. However, crushed stone prevents issues that sand backfill might cause, such as settlement of the pool shell and bulges in the shell’s side walls. In-ground fiberglass pools need concrete poured around the perimeter to keep the pool shell in place. Rhino-Roc uses extra thick concrete that encases the Rhino-Rod and flows beneath the lip of the pool shell. This basically locks everything into place, ensuring many years of use for both pool and patio. Every fiberglass pool needs to be drained at some point. Rhino-Roc includes a sump pipe that allows for inspection and removal of any ground water around the outside of the pool shell. This is an ideal way to prevent the damage ground water can cause. Put simply, Cross-Lynx is a collection of innovative materials and manufacturing processes that ensure the strongest and most durable fiberglass pools possible. 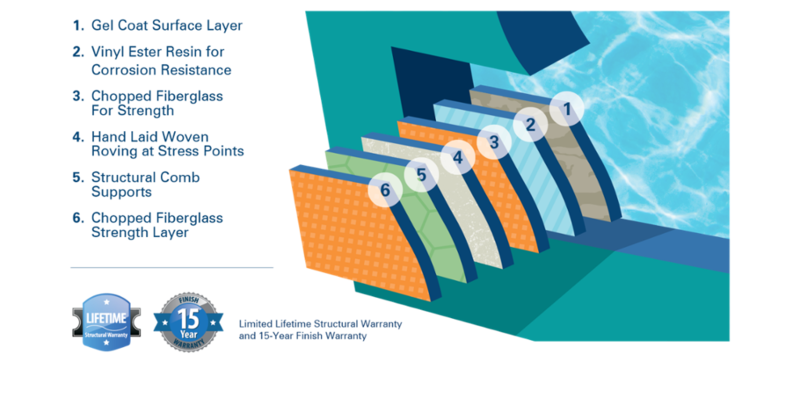 At the core of this technology is polymerization, a process in which polymer molecules form strong webs within each layer of the pool shell structure. The result is a long-lasting and corrosion-resistant shell. The entire surface of a pool with Cross-Lynx technology is a thin layer of gelcoat. This layer, which is the first in the manufacturing process, is spray applied and provides the smooth finish and striking color that make fiberglass pools so attractive. One of the main reasons fiberglass pools are so easy to maintain is the fact that the gelcoat surface is less porous than concrete. This means it’s more resistant to algae and doesn’t require the regular scrubbing and acid washing demanded by other pool surfaces. Cross-Lynx technology ensures maximum strength of this gelcoat surface (and every layer of the pool shell) by linking as many polymer chains as possible. Vinyl ester resin is the second layer of the fiberglass pool manufacturing process. This is a premium-grade resin made especially to prevent osmotic blistering, which can occur when water travels through the gelcoat and mixes with other contaminants. Vinyl ester resin forms a water-tight barrier that prevents blisters from forming on the gelcoat surface. Chopped fiberglass is the next layer, and it’s all about adding strength to the pool shell. It’s applied with a “chopper gun” that cuts fiberglass and sprays resin and catalyst onto the mold. The end result is a durable and long-lasting shell. A layer of woven roving fiberglass comes next. This reinforcing layer is applied in areas of higher flexural stress, including tanning ledges, steps, and where the pool floor meets the walls. Although fiberglass is naturally flexible, there are times when it needs to stay put. That’s why the next layer is made of structural comb ribs to add support throughout the pool shell. These strengthening supports are used along the side walls of the pool and under all steps, benches, and tanning ledges. The final layer involves additional chopped fiberglass, which gives even more strength to the shell. When this layer is added, it acts as a heat blanket that keeps the cross-linking process going through all layers of the shell.